Sample is 3/4-by-3-1/8-inch square-edge solid strip. 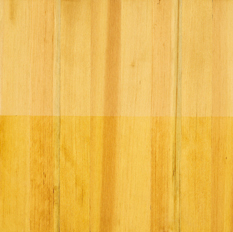 Color: Heartwood is yellowish tan to light brown. Sapwood is tan to white. Heartwood may be confused with that of Southern yellow pine. Radical color change upon exposure to sunlight. Grain: Normally straight, with occasional wavy or spiral texture. Nearly all fir flooring is vertical- grain or riftsawn clear-grade material. Variations Within Species And Grades: Wood varies greatly in weight and strength. Young trees of moderate to rapid growth have reddish heartwood and are called red fir. The narrow-ringed wood of old trees may be yellowish-brown and is known as yellow fir. Hardness/Janka: 660; 49% softer than Northern red oak. Dimensional Stability: Above average (change coefficient .00267; 28% more stable than red oak). Durability: Durable but easily dented. Somewhat brittle and splinters easily, especially with age. Used for flooring, but may not be suitable for all applications due to its softness. Sawing/Machining: Harder to work with hand tools than the soft pines. Comments: Sometimes milled for flooring as end-grain block, which is significantly harder than plainsawn.